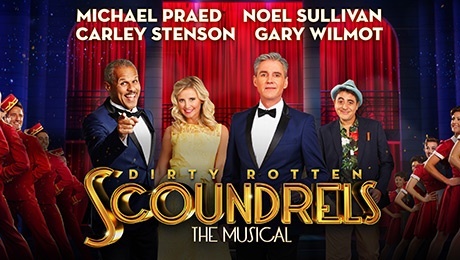 Based on the film of the same name, Dirty Rotten Scoundrels: The Musical returns to London on the back of a UK tour, and boasting a new cast of familiar faces. Whilst at times the set couldn’t keep up with the fast-paced nature of the production (there were a few occasions when the scenery got stuck on its rollers), this is a show that is slick, fizzy, and fast-talking, boasting big, old-fashioned, starry numbers, and a host of excellent performances. Praed is perfectly at home in the role of Lawrence, capturing the conman’s seductive wit and vanity so that he easily draws the audience into his world. Special mention must also go to Noel Sullivan: you might recognize Noel from his former days as one of the members of pop group Hear’Say, but he more than proves his leading man status here. He is a revelation in the part of Freddy, instantly winning over the audience with his warmth and good humour, and building an excellent comic rapport with Praed. The scene in which his mentor attempts to provoke a reaction whilst Freddy is pretending to be paralyzed is a particular comic highlight, thanks largely to Sullivan’s hilarious facial expressions. In the performance I saw he received the biggest cheer of the night at the curtain call. The supporting cast are also fantastic: Phoebe Coupe is hilariously vulgar as Jolene, the heiress from Oklahoma, and one of Lawrence’s first victims, who performs a spectacular country-and-western-inspired paean to her homeland. Geraldine Fitzgerald is also dryly witty as Muriel, a Surrey matron who strikes up a sweetly awkward romance with Andre. Overall, this is a light and bubbly evening’s entertainment, with plenty of memorable songs and spectacular dance routines, all set within the warmly-lit, envy-inducing surroundings of the French Riviera. The cast are clearly having enormous fun throughout the show, and the good humour is infectious. Occasionally dirty-minded but far from rotten, this show makes the ideal sunny escape from a wet autumnal evening.